The health of an aquaponics systems depends heavily on the dissolved oxygen (DO) levels among other things. Traditionally, dissolution of oxygen is accomplished by using aeration methods that introduce fine air bubble in the water via an air diffuser under pressure. What is the size of my fish tanks and how much water do I have? 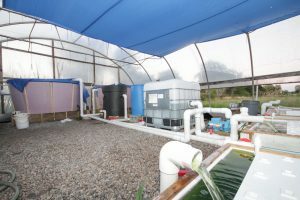 The volume of water directly correlates with the amount of the oxygen that will be required in the system since feed per day in a given volume of water creates the dissolved oxygen (DO) load in an aquaponics system. How many and what kind of fish do I want to raise? The number of fish is the most critical component that dictates the amount of oxygen that is required to keep the system healthy. In general, and intuitively the greater the number of fish the more oxygen is required in the system. There are other factors such as pH and temperature that greatly affect the O2 levels however without the dependency of the fish biomass, changes to the oxygen demand are almost irrelevant. How many deep water grow beds and media will I need to provide adequate Biological Surface Area (BSA)? Grow beds especially media beds provide the surface area for the bene ficial bacteria to colonize and propagate throughout the system. A healthy aquaponics ecosystem has an abundant microbial population which is directly proportional to the surface area available in the system. In addition to the grow media, bioreactors with biomedia are added to aquaponics system to ensure that sufficient surface area is available especially through the initial nitrification cycle of the system and also as the system matures. What will be my flow rate and the pump size to circulate the water? The flow rate determines how fast the water moves through the system which affects how much oxygen can be absorbed in the water. Fast moving water absorbs greater oxygen due to its higher turbulence. A pump that provides at least 1:1 circulation ratio which is the turnover of the water volume at least once per hour should be incorporated to provide sufficient water flow. How big of an air pump and how many air stones do I need to maintain safe levels of Oxygen? (generally 6.0 mg/L or above). The air pump size is dependent on several factors which need to be accounted for through a proper design procedure. As mentioned before, aeration is achieved using air diffusers or air stones; there are many other methods of aeration some more efficient than others. Generally, the higher the efficiency of an aeration method the more expensive the system. Diffusers are rated using a term called Cubic Feet Per Minute or CFM which is a measure of the volume of air a diffuser can release at a certain pressure. 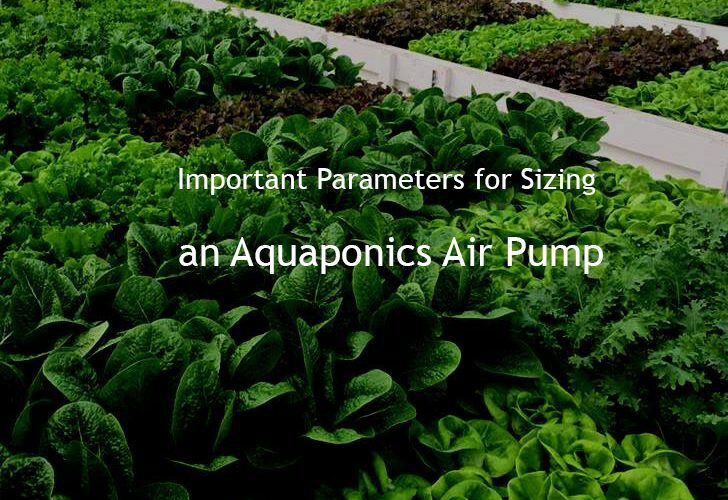 This is a key parameter in sizing the aeration system and will become clear in the example given in a related blog; see Step by Step Guide to Sizing and Air Pump for Aquaponics for an in depth design example. 025kg of O2 needed per kg of feed fed to the fish for the fish. 012kg of O2 needed per kg of feed fed for the nitrifying bacteria. There is 21% oxygen in ambient air. There is 0.075 lbs of air in a cubic foot (ft3). By weight, 23% of a cubic foot of air is oxygen (oxygen is heavier than many of the other gases in air).